Luxury is all about ‘swinging on stars and bringing moonbeams home in a jar.’ It’s a never-ending venture and everyone is expected to join in! Everyone except fish, that is. A destination that has caught my attention lately has been Marina Bay Sands, or MBS, a hotel that manages to be an experience to remember. 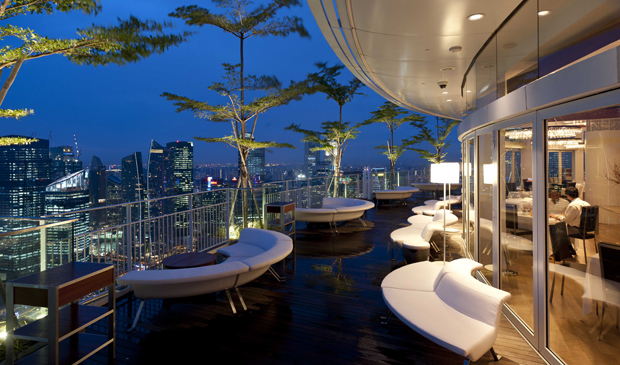 My goal is to investigate and enjoy luxury destinations and what better place to explore than the hotel that transformed the Singapore skyline in 2010? I missed the spectacular grand opening of this hotel in 2011 and decided to make up for it by taking a week-long visit around Singapore and looking into the Charles and Ray Eames design exhibit on display at the MBS museum this month. After all, these were inspiring innovators who designed much of what we use today. When I arrived at this unique hotel, I found my bedroom and bathroom to be truly indulgent. After exploring the design exhibit, I headed toward Orchard Road, Singapore’s shopping and restaurant Mecca. I heralded a taxi and set off to explore ION first, with its luxury labels, including DIOR, Sephora and Prada. After a thoroughly magnificent time learning that ION also had art galleries, I managed to come across a spot for personal indulgence and was given a relaxing AVIVA massage at Estheva Spa to improve my blood circulation. My next venues were Knightsbridge and Orchard Central, where I knew there was the world’s tallest Via Ferrata climbing wall. Then, it was onto Tanglin Shopping Centre, often known as “Tang,” where the Asia Ancient Gallery caught my eye. Antiques, Japanese and Chinese artefacts, even Abercrombie and Fitch could be found here! 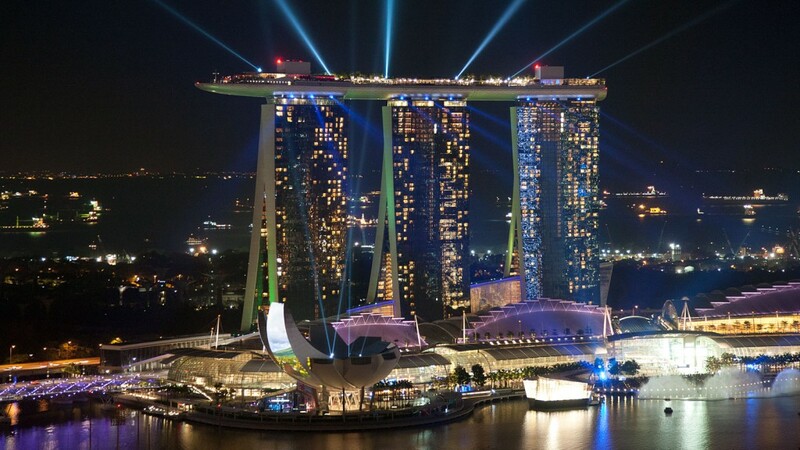 I returned at a late hour, after making some memorable purchases, to the 1000-room Marina Bay Sands. I found there was no shortage of people with which to converse or take photographs of. The view of the bay in Singapore Strait was spectacular, and the selection of food was unmatched as I explored and sampled at the Marina Bay Sands’ shopping area. For those interested in breakfast, it is served on the rooftop and, really, the view is an experience no one should miss! I even tried the eggs Benedict with cheese, which was quite delicious. Of particular interest to me was the unique infinity edge swimming pool in Sky Park at MBS. 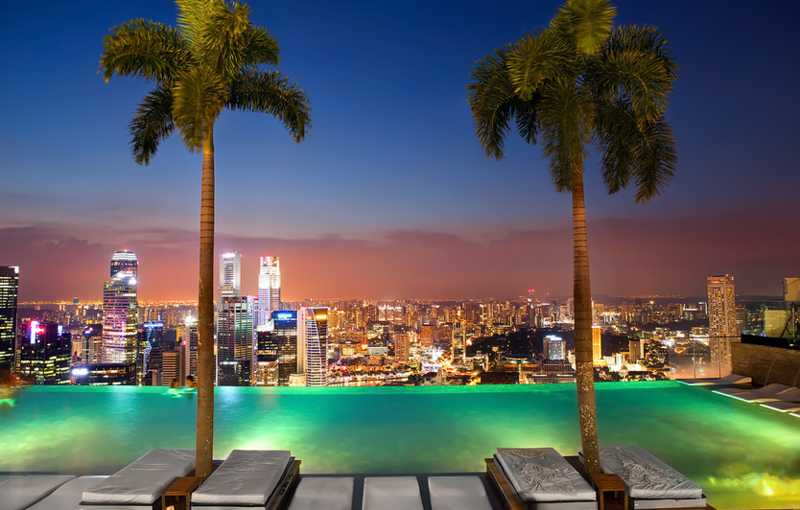 I wanted to get the sensation of swimming above a metropolis and to feel the vertigo when one swims to the edge of the pool, also the hotel’s rooftop edge, and a sheer drop of 57 stories. When I made it to the pool, I found a section for adults only and settled in. Yes, I found out, it produces quite a thrill to be that high and the views are one step short of heaven. After my rejuvenating and eye-opening swim, I decided to try Sky on 57, the hotel’s restaurant near the pool. The rooftop also houses a garden area, by the way, where guests can have an espresso or snack. I ordered a la carte from the restaurant and selected the fresh oysters to get started. While enjoying such an astounding view, I felt it was appropriate. This was a place made for proposals! For dinner, I was pleased to find fresh Sea Bass was available. I always love the taste of fresh fish, and this proved to be the perfect selection. I enjoyed Chrysanthemum Flower Sorbet for dessert, along with the view, where I could even spot Sentosa Island.